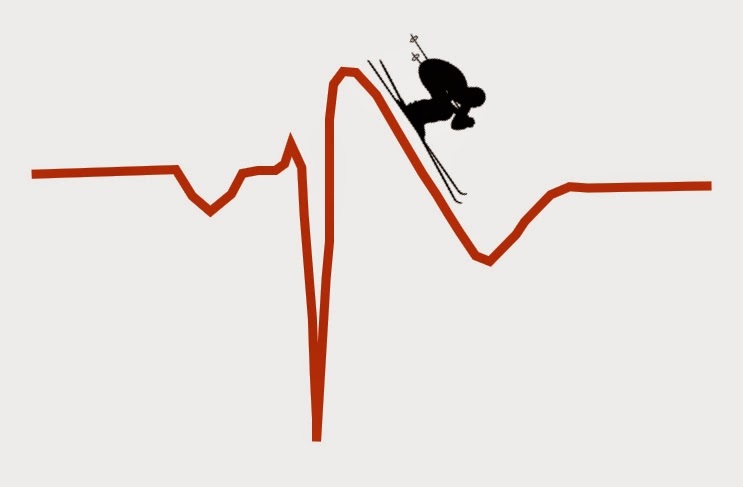 Coved-type ST elevation of Type 1 Brugada - Don't you just want to ski down it? On further history, the patient denied any recent syncope or pre-syncope but reported having 5 prior syncope episodes throughout his lifetime (most during adolescence and last episode 2 years ago on an airplane). These episodes were without any associated prodrome, such as dizziness, blurred vision, chest pressure or palpitations. He reports that his mother’s cousin died suddenly at the age of 40 while mowing the lawn and had no known cardiac disease.The EKG finding was discussed with EP fellow and close follow-up was arranged. Since patient was in ED for likely unrelated complaint, his risk of sudden cardiac death was thought to be relatively low. Brugada syndrome (BS) is often the result of a Sodium channelopathy but since many patients are found without mutations, it is now also believed to be influenced by gender, drugs, and an imbalance in autonomic tone (and unidentified underlying genetic mutations may not yet have been identified). The overall prevalence of Brugada type 1 is estimated to be 0.05%. It is most common in Southeast Asia but has been reported in every ethnic group. BS is typically seen in those younger than 50 years of age. - history of syncope or nocturnal agonal respirations. 1) Type 1: RBBB with coved type ST-elevation and T wave inversion. 3) Type 3: morphology of Type 1 or Type 2 but with less than 2 mm of ST elevation. In studies in both Europe and Japan, the estimated prevalence of Type 1 Brugada EKG findings (as seen in our patient) in an otherwise healthy population is .05 - 0.1%. The saddleback type is much more common (estimated prevalence of 2-6%), but is also much less specific or predictive of true Brugada syndrome. 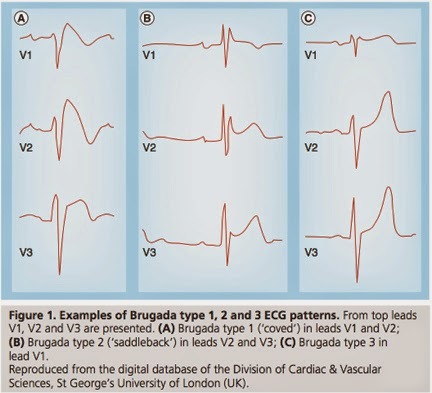 Some proportion of those recorded as "Type 2" Brugada are likely benign J-point elevation. Based on this information, the annual risk of death in my patient would be somewhere between 0.5 – 1.9%. The only treatment proven to be effective for Brugada syndrome is implantation of an Automated Internal Cardiac Defibrillator (AICD). AICD implantation is a Class I recommendation for any patients who have suffered aborted cardiac death and for any patients who have suffered seizure, syncope, or had nocturnal agonal respirations without an obvious noncardiac cause. Implantation of an AICD is otherwise considered a Class II recommendation in the following patients: 1.) those who have had a syncopal, seizure, or agonal respiration event AND who had only drug-induced (via Na-channel blocker) Type 1 Brugada EKG, 2.) Asymptomatic patients with a family history of SCD and a spontaneous OR drug-induced Type 1 Brugada EKG. Lastly, in the setting of acute illness and Brugada pattern findings, make sure to replete electrolytes (if patient has GI illness), and treat fevers with antipyretics. You should also investigate to see if patient is on any possibly exacerbating drugs such as tricyclics, psychotropics, or other sodium channel blockers and consider discontinuation of these drugs. So what happened with out patient? He returned three weeks later for elective ICD implantation. He was discharged home the following day. Take Home Points: In conclusion, any patient seen in the ED for recent syncope, seizure or (of course) sudden cardiac arrest and has Type 1 Brugada EKG findings should absolutely be admitted to high-risk telemetry bed. Otherwise discharge with close follow-up can be considered but should ideally be arranged with careful discussion with patient, primary physician, and a cardiologist. 1.Li A, Behr ER. Brugada Syndrome: an update. Future Cardiology. 2013. 9(2): 253-271. 3.Probst V, et al. Long-term prognosis of patients diagnosed with Brugada syndrome: Results from the FINGER Brugada Syndrome Registry. Circulation. 2010. 121(5): 635-43. 6. Hermida, J. S., Lemoine, J. L., Aoun, F. B., Jarry, G., Rey, J. L., & Quiret, J. C. (2000). Prevalence of the Brugada syndrome in an apparently healthy population. The American journal of cardiology, 86(1), 91-94. 7. Miyasaka, Y., Tsuji, H., Yamada, K., Tokunaga, S., Saito, D., Imuro, Y., ... & Iwasaka, T. (2001). Prevalence and mortality of the Brugada-type electrocardiogram in one city in Japan. Journal of the American College of Cardiology, 38(3), 771-774. Read more about Brugada syndrome here at Life in the Fast Lane and listen to Amal Mattu's excellent episodes 1 and 2. 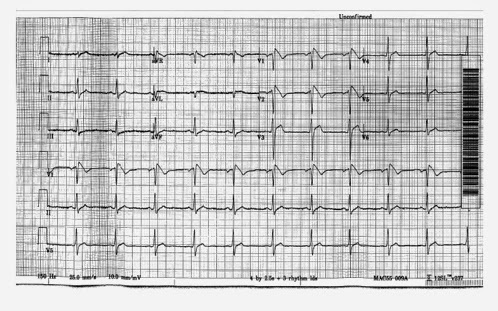 For more about Can't Miss EKG findings in Syncope, read the case conclusion to EKG challenge No. 4 here.